The biography of Father Cavallucci, reproduced in the first volume of the past Documentation about Rita, says that since that time "many silver, wax images, chains of slaves, broken off canes of weapons" could be seen near Rita’s tomb and these were very faithfully recorded by the Notaries in presence of the witnesses. "Near the holy body of Rita", the biographer writes on, "you can see that many ill and hurt people are recovered, many blind people have the light, many dumb people can speak, crippled and lame people are recovered"; moreover possessed people were freed and there were people who said that they had escaped sure death through sister Rita’ s intercession. 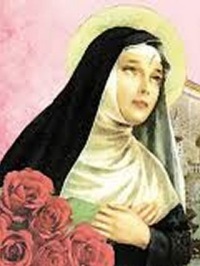 On 25th May 1457, Batiste D'Angelo from Colgiacone who was completely bind, addressed devout prayers to God staying in front of the body of blessed Rita, and for infinite mercy his prayers were answered and he could see again. On 25th of this month Lucretia of Ser Pauolo from Colforcello, who felt very badly because of her age, said devout payers in front of the body of blessed Rita and became as healthy as before. Also in the same month a woman called Cecca d' Antonio, deaf on one side for five years, invoked God and Blessed Rita and she was recovered with clear signs in presence of many people. On 29th of the same month Salimene Antonio from Poggio, having had no touch in one finger of the hand for a long time, approached it to the body of blessed Rita with great reverence and humility, devotion and faith and he was recovered in presence of the many people; crying he thanked the Gentleman and Blessed Rita. On the last day of May 1457 Giacomuccia of Leonardo from Ocone tormented for many years by serious pains at the legs because of which she had eaten very few for two years, was taken in front of the body of Blessed Rita where she prayed her and God and after eight days spent in the church she was recovered and very glad she thanked God mainly, as well as Blessed Rita. In the same day Cecca of Gio from Biselli of Norcia who was dumb from her birth, as the relatives and other people who were with her in presence of the Saint’s body testify, after devout prayers began to speak and to say Hail Mary and other words, while relatives and all the people were astonished. On the second of June 1457 Bernardo, Matteo del Re from Ocone’s son had a stone in the blister, causing him big pain, seeing thousand died people an hour, he voted to Blessed Rita and for her merits he was recovered by Divine grace. On the 3rd of the same month Spirito d’Angelo from Cassia who had suffered very intense pain for four continuous years, addressed himself to Blessed Rita and he was recovered. On the 7th Mattia of Cancro from Rocca Indulsi of Norcia who was dumb from birth was taken by his parents to the saint’s body and while all the presents were praying he obtain from God the grace and talked fluently; all people were astonished and moreover all priests made processions and the R.P. Master Giovanni made a preach. In that day Cecco d'Antonio from San Cipriano dalla Matrice, dumb from birth, was lead by his Father to the body of Blessed Rita. After very fervour prayers for two days he received the grace and talked with the astonishment of all the people. On the 8th of June 1457 Lucia of Santi from the Castel of Santa Maria of Norcia who had been completely blind for 15 years as far as one eye was concerned while the second eye could hardly see a light was driven to holy Rita’s body, where stayed for 15 days with prayers she was finally recovered and thanked with tears the Divine Lord. As it can be seen, the miraculous recoveries concern very different diseases including blindness and dumbness from birth. The other miracles happened between 1447 and 1603 and concern every kind of disease: total paralysis, stones in the blister, difficulties in speaking, hurt, abscesses in throat, madness, haemorrhages, possession by "bad spirits", plague, cancer to the throat and so on. Father Cavallucci not only accurately reports and files the miracles but he informs that "still today when the Case and the tomb where that body lies are opened you can smell a perfume which seems made by several fragrant mixtures. You can smell it until the tomb is opened; indeed it was noticed and accurately reported that every time Jesus Christ grants a grace by intercession of Blessed Rita this perfume can be smelt many days in advance even if the tomb is closed and after smelling the perfume for many days someone came from different countries and gave alms as his votes had been answered...". Cavallucci says further that in the month of May the nuns of the monastery used to prepare small breads which they distributed to people in need in the day of the festivity of sister Rita, on 22nd of the month and many of them came freed from fevers and other illness as they had tasted that bread. Moreover the oil of the lamp which constantly lighted over the tomb of Rita was thought miraculous; therefore "the nuns give some oil of that lamp to many people so that they grease their painful body and truly that oil has given much release to many people".